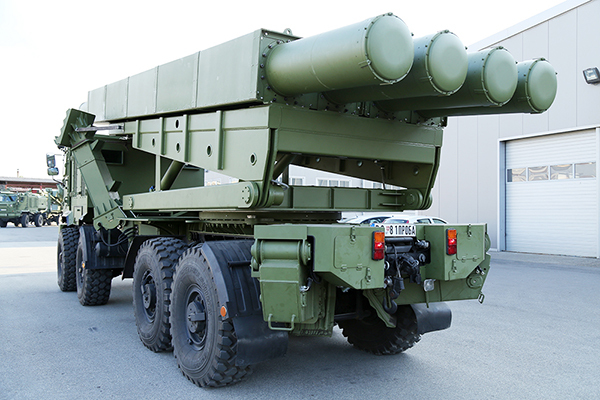 As a self-propelled multiple launch weapon “SHUMADIA“ is designed for transport and launch of fire-support artillery rockets with trajectory correction (Jerina 1 – J1) and a range of 285 km. Depending on the tactical scenario/operating conditions, the launch weapon is capable of carrying and delivering four or eight rockets. Rockets are factory packed in modules that serve as storage, transport and launch containers. Each module contains two rockets packed in tubes made of composite segments joined with steel attachments and covers providing full protection against the environment. 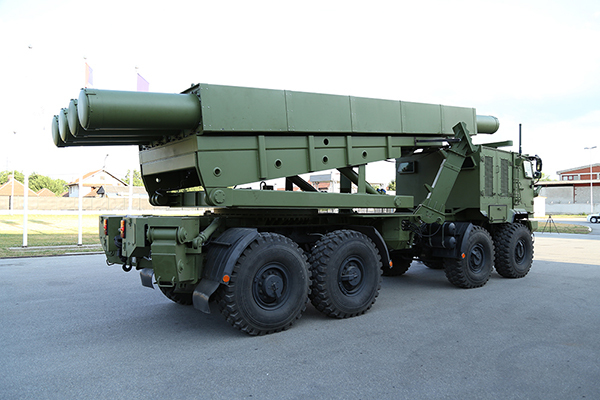 The launch weapon is designed for transport and launch of 262 mm rocket as well, from two launch modules (each accommodating six rockets), to a distance of 70 km – J2 (Jerina 2). The container module is made of steel, with two rocket tubes. When preparing the container for a mission, it is transferred by means of the utility vehicle lifting device on to the launcher elevation platform where it is fixed to place with a latch. After the rockets have been launched, the empty container is replaced with a loaded container using the lifting device on the utility vehicle after leaving the battlefield. The launch platform is a rotary type, and the system is designed so as to allow launching over the cabin at an azimuth angle of ±30°. The launch device consists of the azimuth and the elevation platforms, driven in traverse/elevation by way of an electric motor with pertaining reduction gears. It is equippped with digital traverse and elevation encoders, the inertial navigation system (INS) fixed on the elevation platform, and the orientation and navigation device is based on a GPS system with two GPS receivers housed on the cabin. The launch device is secured to a frame which is then fixed to the vehicle chassis. The suspension system, consisting of four legs with electric motors (or hydraulically-operated), is also attached to the frame. Rockets can be launched at a maximum elevation angle of 48°. The crew includes four members, and the commander and the operator are seated in a cabin behind the driver’s cabin. 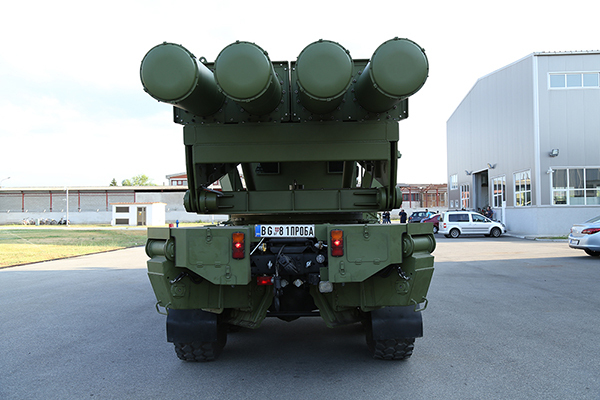 The rocket system is integrated in the modern network central battlefield through its command-information system, navigation system and fire control system. The system features a short transition time from traveling to combat position, and an extremely short time for leaving the battleground. The system is capable of launching four or eight rockets against one or more targets at up to 285 km, with the circular error probability (CEP) of less than 50 m in the INS/GPS guidance mode, or of about 150 m in the INS mode. The rocket system has full autonomy as its command & information/communication system and fire control system are fully autonomous. 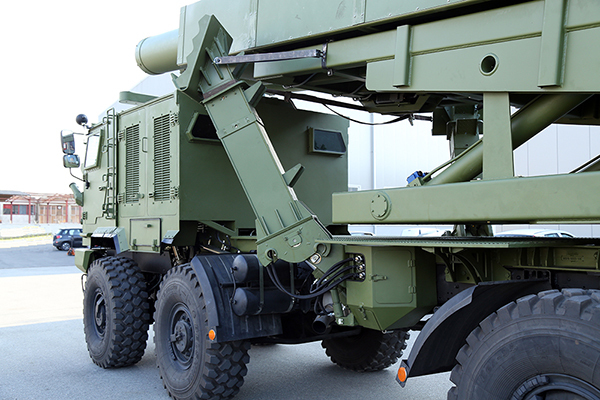 The system can be deployed in a battery of 3-6 launch weapons or in a battalion of 9-18 launch vehicles with utility and communication vehicles. 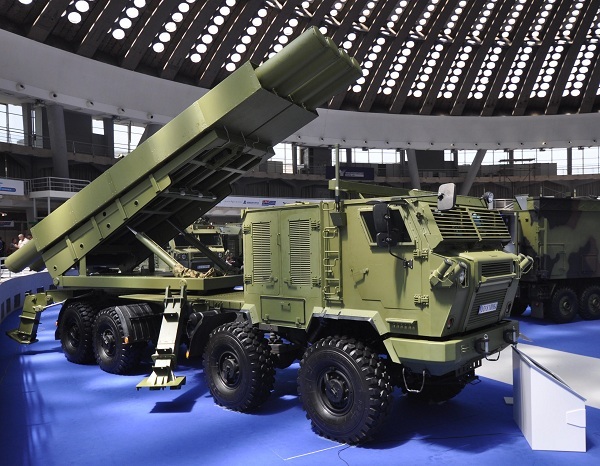 The utility vehicle is capable of carrying four modules, each with two launch containers with rockets, and a lifting device used for reloading the launch weapon. 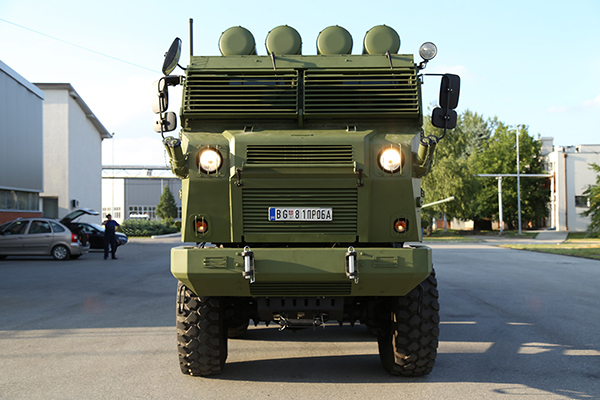 Command vehicles can also be attached to the battery, while target data can be obtained from UAVs, reconnaissance aircraft, special reconnaissance teams or in other ways. The rocket weighs approximately 1,550 kg. The weight of the storage/transport/launch module with two rockets is about 4,200 kg. 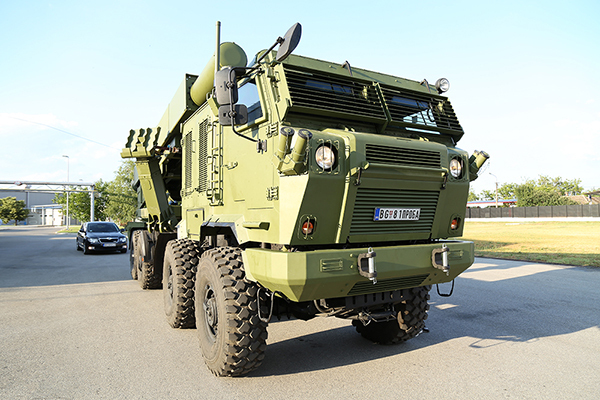 The system is mounted on a high mobility 8x8 wheeled chassis with a carrying capacity of 38 t, equipped with the central tire inflation system and run-flat inserts for off-road driving. The chassis has a high operational and tactical mobility capability, driving autonomy of over 600 km and maximum speed of more than 100 km/h. The system is intended against important enemy point and area targets, and against time critical targets (owing to the critical time response) such as ground to ground rocket systems, air defense systems, airports, heliports, concentration areas, military bases, training camps, logistics centers, harbors, concentrated troops, important military infrastructure facilities, command centers, communication centers etc. The crew cabin is equipped with ballistic protection against fragmentation effect.